If you value your online privacy you should know the first level of protection to safeguard your sensitive data resides in your web browser. 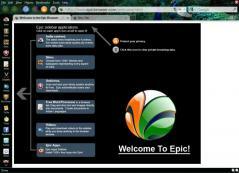 Epic is a free, intuitive web browser that bundles several security modes in a functional environment, designed to offer the best possible browsing speed. This Chromium-based browser will be familiar for Chrome users – it supports multiple tabs, bookmarks, hotkeys, page printing and zoom in/out among other essential features. Furthermore, you can change the browser’s language, see your downloads history and import bookmarks and settings from Firefox and Internet Explorer. What’s unique in the Epic browser is its focus on privacy – it offers several security modes you can easily activate. You can use the proxy mode and your IP address will remain hidden while you’re browsing the web. The application also lets you disable plugins, block third-party cookies, encrypt data, use the „Do Not Track Me” feature, block ads and trackers, create custom blocking lists as well as see information about the blocked ads and trackers. The browser will not store your searches or send your search terms to other webpages and it also comes with several tools for cleaning browsing data such as visited URLs, local storage, login data, shortcuts, Flash and Silnerlight cookies and so on.